Features a 28" widescreen, anti-glare, flat-panel display. diagonal screen size 28 in. 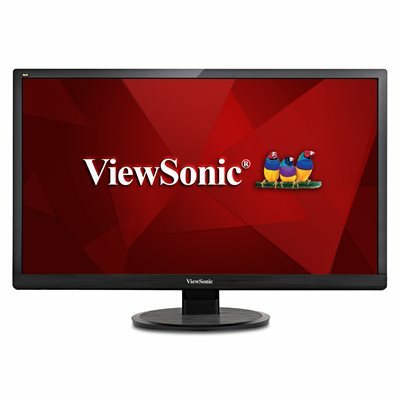 dimensions 15.4" x 26" x 1.9"
The ViewSonic VA2855Smh is a 28” Full HD 1080p monitor designed for both home entertainment and office use. Equipped with SuperClear Pro MVA panel technology, true 8-bit colors, and a 3000:1 static contrast ratio, the VA2855Smh delivers superior color performance with excellent color reproduction at nearly any viewing angle. Vivid 1920x1080 resolution and dual stereo speakers deliver an immersive viewing experience ideal for any multimedia application, while HDMI and VGA inputs provide flexible connectivity to PCs, laptops, and other multimedia devices. ViewSonic’s exclusive ViewMode provides intuitive presets to deliver optimized screen performance in different applications. With an energy-saving Eco-mode feature and ENERGY STAR compliance, the VA2855Smh is a great long-term investment. With a large 28’’ LED screen, this monitor increases work efficiency and productivity by making it easy to view large spreadsheets or two side-by-side applications. SuperClear Pro MVA panel technology provides True 8-bit color performance that displays 16.7 million undistorted colors, a superior static contrast ratio of 3000:1 for enhanced clarity of detail in the darkest and brightest of images, and wide-angle color consistency for uncompromising image quality at virtually any angle. An ultra-high static contrast ratio of 3000:1 offers a wider range of grayscale to show deeper, richer colors with more visible details in shadows and highlights. With a ratio 3-times higher than standard panels, this monitor can display vivid and realistic images for photo editing, watching movies, or any multimedia application. EPEAT (Electronic Product Environmental Assessment Tool) is a definitive global rating system for greener electronics. This monitor has EPEAT Gold Certification, meaning that it meets 100% of EPEAT’s 23 required performance criteria and a minimum of 75% of its 28 optional criteria.